Since the commencement of the constitutional crisis on 26 October, the Speaker has made several public statements on the need to reconvene Parliament. His most recent statement issued on 5 November reiterates this position. This is not the first time a Speaker of Parliament has made such a decision. In 2003 the then-Speaker, Joseph Michael Perera, came to the same conclusion. We also have a rich history of decisions where the separation of powers is clearly established. In this short brief, Lawyers for Democracy, sets out why the reconvening of Parliament is in accordance with the spirit and the letter of our Constitution, and must be respected and upheld by all parties. First, the Speaker’s decision accords with the principles of Constitutional interpretation. A Constitution is different to an ordinary statute. It is meant to last generations and unlike ordinary laws, an attempt to amend the Constitution may in some instances require a two-third majority and even a referendum. It sets out the grand purposes and objectives of a country, indicating among others how power is structured, the values and principles that guide State conduct and the means of ensuring the sovereignty of the people. It is now established that constitutional interpretation is fundamentally different to statutory interpretation. Therefore, its overarching purposes, as found in its text, history and structure, are relevant. Thus, it must be read as a whole, in a manner that harmonises its different parts, and in manner that realises its purposes as the constitutive document of a democratic State. We note that the Preamble of the Constitution speaks of the following principles: representative democracy, freedom, equality, justice, fundamental human rights and independence of the Judiciary – all enshrined to ensure a just and free society. Any interpretation must seek to reconcile the text with these purposes. In the present context, Article 70(1) of the Constitution is relevant and reads as follows: “The President may by Proclamation, summon, prorogue and dissolve Parliament”. It is a canon of statutory interpretation that the inclusion of one thing is the exclusion of all others. In this case, it is argued that the inclusion of the President as the agent of prorogation denudes all other agencies, especially Parliament, from having any say in the question of prorogation. We disagree with this type of clause-bound literalism. A Constitution must be interpreted of its purposes, so long as the text can bear such purposes. These are found in its structure, its history and its text. Second, we note that the Constitution organises the power of the people in a distinct manner. As provided in Article 3 of the Constitution, it is the people, rather than any branch of government, that are sovereign. The powers of government that flow from sovereignty are held in trust and exercised by the different organs of government with Parliament exercising the legislative power of the people, the President, the Cabinet, the executive power of the people and Parliament through courts and other institutions exercising the judicial power of the people. First, Article 33A provides that the President is responsible to Parliament for due exercise, performance and discharge of his powers, duties and functions under the Constitution and any written law. Second, Article 42 (2) provides that the Cabinet of Ministers is collectively responsible and answerable to Parliament. Third, Article 148 clearly provides Parliament full control over public finance. Fourth, any Member of Parliament may initiate impeachment proceedings against the President in adherence to the steps provided in Article 38(2). Fifth, Parliament has the sole power post the enactment of the 19th Amendment to the Constitution to dismiss a government by a motion of no-confidence, a defeat of the Budget, or a defeat of the Statement of Government Policy (Art.48(2)). The above demonstrates that the Parliament has a unique role in holding the executive arm accountable for its use of the people’s power. As such, any interpretation of the Constitution must seek to protect, rather than prevent, this function. An interpretation of the Constitution that allows the executive to subvert this role, to silence Parliament and prevent it from deliberating on these key issues is one that subverts the sovereignty of the people. The power to prorogue Parliament is found in Chapter XI of the Constitution titled “Legislature: Procedure and Powers”. It must be read and understood from the perspective of its historical roots. The power to prorogue is a ceremonial power of a Head of State, identical to the ceremonial power that titular heads of State have under Westminster systems. Thus in Sri Lanka’s Independence Constitution, and in the 1972 Constitution, the Governor-General and the President respectively had this same power. In such systems, the power to prorogue can only be exercised on the advice of the Prime Minister with the concurrence of Parliament. The fact that this power is a ceremonial power derived from the Westminster system, and therefore best understood as governed by the conventions of that system, is confirmed by the fact that other executive presidential systems, most notably France and the United States of America, do not give the executive this power. We note that the power to prorogue entails serious consequences for democracy and the functioning of our system of government. The power to prorogue must not be read in a manner that allows one branch of government to silence another, or to prevent it from carrying out its constitutional function. Prorogation is different to dissolution, since dissolution has an in-built checking mechanism to prevent its abuse – it is immediately followed by a hearing from the people at an election. Prorogation, on the other hand, if the broader textual, historical and structural context is ignored, can be used to subvert the will of the people. Therefore, we state that Article 70(1) must be read as including an implied requirement that when exercising this power, the President must act in accordance with the will of a majority of the representatives of the people, as conveyed by the Speaker of the House. This has been the convention in Sri Lanka. We also note that a decision by the Speaker cannot be prevented by any officer. We are deeply disturbed by reports that the Secretary-General of Parliament and his staff have acted beyond powers provided under the Standing Orders and attempted to delay the Speaker’s decision from being implemented. We see this as an extremely serious development which undermines and threatens the Speaker’s office. 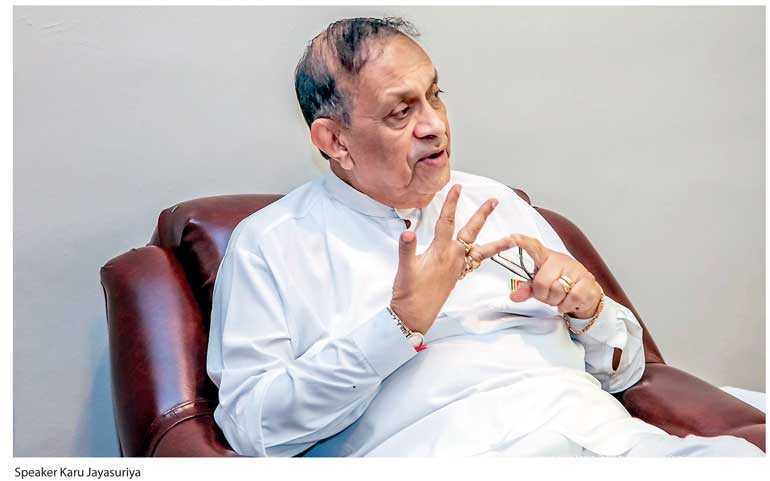 Parliament is the custodian of our Parliamentary democracy and any attempt to prevent his powers and functions must be considered as a serious affront to Sri Lanka’s democracy. We believe the present crisis is an attempt by the Executive to actively and deliberately undermine the Constitution of Sri Lanka. Several unconstitutional and illegal acts have followed since the unconstitutional dismissal of Prime Minister Wickremesinghe. Whilst the President has the power to prorogue Parliament, the present instance reeks of mischief where Executive action has deliberately prevented the elected representatives of the people to decide what has been constitutionally mandated. It is the people’s representative who has the power to decide who forms government, not one individual. Sri Lanka now faces an unprecedented constitutional crisis that goes to the heart of our democracy. We urge the Speaker to take immediate steps to reconvene Parliament.